This entry was posted on Monday, April 6th, 2009 at 11:53 am and is filed under CPN Maoists, Goverment, hydropower. You can follow any responses to this entry through the RSS 2.0 feed. You can leave a response, or trackback from your own site. I am sorry Rajesh Dai I credited you as a @Falano on my twitter. I regret it and I will credit it as @phalano next time. Nice caption, I like very much!! La BarBaad !! Kisun Ji ko Joke bhanda charko Joke Bho yo ta, Hajur ! 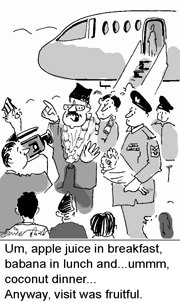 Please make one cartoon with PM’s instruction/Recommendation of different medals to Moist players. Not a bad idea.